When it comes to designing a granny flat, we understand that one size doesn’t fit all. 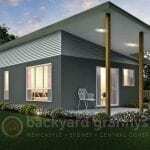 At Backyard Grannys, we offer contemporary and stylish designs to suit your needs, space and budget. 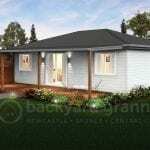 The Berrigan granny flat design offers an ideal retreat, perfect for suburb living. Ideal for shared living, the Berrigan design is unique incorporating two bedrooms and two ensuite bathrooms. The floorplan has been popular in suburbs close to universities and well suited to student housing. 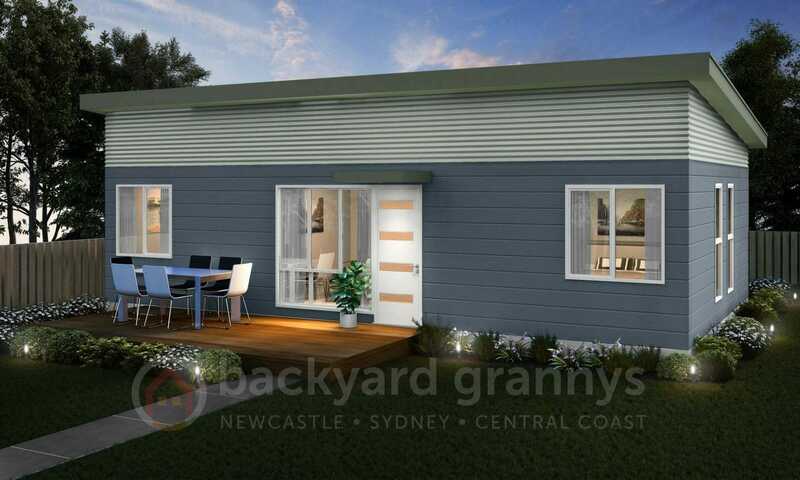 Featuring an open plan living, the Berrigan granny flat design offers a seamless flow from the kitchen through to the living and dining room. This makes it a really nice space to interact with family and guests. The open floor plan also draws in more natural light to illuminate the house interior, which in turn creates a more spacious feel. The design offers flexibility to create an island bench with room for breakfast bar seating as an alternative to a dining table and creating a larger lounge space. The clever compact design allows plenty of storage with the laundry incorporated in its own separate cupboard. The inclusion of the front patio has been a popular addition as it gives more room for outdoor relaxation, providing you with a perfect escape to unwind, relax and have fun.